[1. "If a wise man hold his body with its three parts (chest, neck, and head) erect, and turn his senses with the mind towards the heart, he will then in the boat of Brahman cross all the torrents which cause fear. "Compressing his breathings let him, who has subdued all motions, breathe forth through the nose with the gentle breath. Let the wise man without fail restrain his mind, that chariot yoked with vicious horses. "Let him perform his exercises in a place level, pure, free from pebbles, fire, and dust, delightful by its sounds, its water, and bowers; not painful to the eye, and full of shelters and eaves. "When Yoga, is being performed, the forms which come first, producing apparitions in Brahman, are those of misty smoke, sun, fire, wind, fire-flies, lightnings, and a crystal moon. "When, as earth, water, light, heat, and ether arises, the fivefold quality of Yoga takes place, then there is no longer illness, old age, or pain for him who has obtained a body produced by the fire of Yoga. The first results of Yoga they call lightness, healthiness, steadiness, a good complexion, an easy pronunciation, a sweet odour, and slight excretions "(Çvet. Upanisad, ii. 8-13). "When the five instruments of knowledge stand still together with the mind, and when the intellect does not move, that is called the highest state. "This, the firm holding back of the senses, is what is called Yoga. He must be free from thoughtlessness then, for Yoga comes and goes" (Katha Upanisad, ii. 10, 11). "This is the rule for achieving it (viz., concentration of the mind on the object of meditation): restraint of the breath, restraint of the senses, meditation, fixed attention, investigation, absorption-these are called the sixfold Yoga. When beholding by this Yoga, be beholds the gold-coloured maker, the lord, the person, Brahman, the cause; then the sage, leaving behind good and evil, makes everything (breath, organs of sense, body, etc.) to be one in the Highest Indestructible (in the pratyagatman or Brahman) " (Maitr. Upanisad, vi. 18). "And thus it has been elsewhere: There is the superior fixed attention (dharana) for him-viz., if he presses the tip of the tongue down the palate, and restrain the voice, mind, and breath, he sees Brahman by discrimination (taraka). And when, after the cessation of mind, he sees his own Self, smaller than small, and shining as the Highest Self, then, having seen his Self as the Self, he becomes Self-less, and because he is Self-less, he is without limit, without cause, absorbed in thought. This is the highest mystery--viz., final liberation " (Maitr. Upanisad, vi. 20). Mount of Holy Vulture, and the latter was acknowledged as the first patriarch, who, in turn, transmitted the doctrine to Ananda, the second patriarch, and so till Bodhidharma, the twenty-eighth' patriarch. We have little to say about the historical value of this tradition, but it is worth while to note that the list of the names of these twenty-eight patriarchs contains many eminent scholars of Mahayanism, or the later developed school of Buddhism, such as Açvaghosa, Nagarjuna, Kanadeva, and Vasubhandhu. The first twenty-three patriarchs are exactly the same as those given in 'The Sutra on the Nidana of transmitting Dharmapitaka,' translated in A.D. 472. King Teh Chwen Tang Iuh (Kei-toku-den-to-roku), a famous Zen history of China, gives two elaborate narratives about the transmission of Right Dharma from teacher to disciple through these twenty-eight patriarchs, to be trusted without hesitation. It would not be difficult for any scholar of sense to find these statements were made from the same motive as that of the anonymous author who gives a short life, in Dirghagama-sutra, of each of the six Buddhas, the predecessors of Shakya Muni, if he carefully compare the list given above with the lists of the patriarchs of the Sarvastivada school given by San Yin (So-yu died A.D. 518) in his Chuh San Tsung Ki (Shutsu-san zo-ki). 2. One of the founders of Mahayana Buddhism, who flourished in the first century A.D. There exists a life of his translated into Chinese by Kumarajiva in A.D. 401-409. The most important of his works are: Mahayanaçraddhotpada-çastra, Mahalankara-sutra-çastra, Buddha-caritakavya. 3. The founder of the Madhyamika school of Mahayana Buddhism, who lived in the second century A.D. A life of his was translated into Chinese by Kumarajiva in A.D. 401-409. Twenty-four books are ascribed to him, of which Mahaprajñaparamita-çastra, Madhyamika-çastra, Prajñadipa-çastra, Dvadaçanikaya-çastra, Astadaçakaça-çastra, are well known. talk sociably; while the former would not smile at any face, but would stare at it with the large glaring eyes that penetrated to the innermost soul. The latter would keep himself scrupulously clean, shaving, combing, brushing, polishing, oiling, perfuming, while the former would be entirely indifferent to his apparel, being always clad in a faded yellow robe. The latter would compose his sermon with a great care, making use of rhetorical art, and speak with force and elegance; while the former would sit as absolutely silent as the bear, and kick one off, if one should approach him with idle questions. 3. Bodhidharma and the Emperor Wu.--No sooner had Bodhidharma landed at Kwang Cheu in Southern China than he was invited by the Emperor Wu, who was an enthusiastic Buddhist and good scholar, to proceed to his capital of Chin Liang. When he was received in audience, His Majesty asked him: "We have built temples, copied holy scriptures, ordered monks and nuns to be converted. Is there any merit, Reverend Sir, in our conduct?" The royal host, in all probability, expected a smooth, flattering answer from the lips of his new guest, extolling his virtues, and promising him heavenly rewards, but the Blue-eyed Brahmin bluntly answered: "No merit at all." the first principle of Buddhism?' Thus thinking, he inquired: "What is the holy truth, or the first principle?" The answer was no less astonishing: "That principle transcends all. There is nothing holy." The crowned creature was completely at a loss to see what the teacher meant. Perhaps he might have thought: 'Why is nothing holy? Are there not holy men, Holy Truths, Holy Paths stated in the scriptures? Is he himself not one of the holy men ' "Then who is that confronts us?" asked the monarch again. "I know not, your majesty," was the laconic reply of Bodhidharma, who now saw that his new faith was beyond the understanding of the Emperor. [1. Northern Gi dynasty (A.D. 386-534). 2 Sho-rin-ji, erected by the Emperor Hiao Ming of Northern Wei A.D. 497.
as we are told by his biographers, attempted to poison him three times, but without success. [1. This reminds us of Nan Yoh Hwui Sz (Nan-gaku-e-shi, died A.D. 577), who is said to have learned Zen under Bodhidharma. He says in his statement of a vow that he was poisoned three times by those who envied him. 2. The translation of Hinayana Zen sutras first paved the way for our faith. Fourteen Zen sutras, including such important books as Mahanapanadhyana-sutra, Dhyanacarya-dharmasañjña-sutra, Dhyanacarya-saptatrimçadvarga-sutra, were translated by Ngan Shi Kao (An-sei-ko) as early as A.D. 148-170. Cullamargabhumi-sutra was translated by K' Yao (Shi-yo) in A.D. 185; Dharmatara-dhyana-sutra by Buddhabhadra in A.D. 398-421; Dhyananisthitasamadhi-dharma-parygya-sutra by Kumarajiva in A.D. 402; 'An Abridged Law on the Importance of Meditation' by Kumarajiva in A.D. 405; Pancadvara-dhyanasutra-maharthadharma by Dharmamitra in A.D. 424-441. Furthermore, Mahayana books closely related to the doctrine of Zen were not unknown to China before Bodhidharma. Pratyutpanna-buddhasammukhavasthita-samadhi was translated by K' Leu Cia Chan (Shi-ru-ga-sen) in A.D. 164-186; Vimalakirttinirdeça-sutra, which is much used in Zen, by Kumarajiva in A.D. 384-412; Lankavatara-sutra, which is said to have been pointed out by Bodhidharma as the best explanation of Zen, by Gunabhadra in A.D. 433; Saddharma-pundarika-sutra, in its complete form, by Kumarajiva in A.D. 406; Avatamsaka-sutra by Buddhabhadra in A.D. 418; Mahaparinirvana-sutra by Dharmaraksa in A.D. 423. If we are not mistaken, Kumarajiva, who came to China A.D. 384, made a valuable contribution towards the foundation of Zen in that country, not merely through his translation of Zen sutras above mentioned, but by the education of his disciples, such as Sang Chao (So-jo, died A.D. 414), Sang Shang (So-sho, whose writings undoubtedly influenced later Zen teachers. A more important personage in the history of Zen previous to the Blue-eyed Brahmin is Buddhabhadra, a well-known Zen master, who came over to China A.D. 406. His translation of Dharmatara-dhyana-sutra (which is said to have been preached by Bodhidharma himself when he was in India) and that of Avatamsaka-sutra may be said without exaggeration to have laid the corner-stone for Zen. He gave a course of lectures on the Zen sutra for the first time in China in A.D. 413, and it was through his instruction that many native practisers of Zen were produced, of whom Chi Yen (Chi-gon) and Hüen Kao (Gen-ko) are well known. In these days Zen should have been in the ascendant in India, because almost all Indian scholars-at least those known to us-were called Zen teachers-for instance, Buddhabhadra, Buddhasena, Dharmadhi, and some others were all Zen scholars. Chinese Buddhist scholars did no less than Indian teachers toward the uprising of Zen. The foremost among them is Hwui Yuen (E-on, died A.D. 414), who practised Zen by the instruction of Buddhabhadra. He founded the Society of the White Lotus, which comprised eighteen eminent scholars of the age among its members, for the purpose of practising Meditation and of adoring Buddha Amitabha. We must not forget that during the Western and the Eastern Tsin (Shin) dynasties (A.D. 265-420) both Taoism and Buddhism grew prosperous to no small extent. And China produced, on the one hand, Taoists of an eccentric type, such as the Seven Wise Men of the Bamboo Forest, while she gave birth to many recluse-like men of letters, such as Tao Yuen Ming (To-yen-mei, died A.D. 427) and some others on the other. Besides there were some scholars who studied Buddhism in connection with Taoism and Confucianism, and led a secluded life. land for the seed of Zen--nay, there had been many practisers of Zen before Bodhidharma. All that he had to do was to wait for an earnest seeker after the spirit of Shakya Muni. Therefore he waited, and waited not in vain, for at last there came a learned Confucianist, Shang Kwang (Shin-ko) by name, for the purpose of finding the final solution of a problem which troubled him so much that he had become dissatisfied with Confucianism, as it had no proper diet for his now spiritual hunger. Thus Shang Kwang was far from being one of those half-hearted visitors who knocked the door of Bodhidharma only for the sake of curiosity. But the silent master was cautious enough to try the sincerity of a new visitor before admitting him to the Meditation Hall. According to a biography of his, Shang Kwang was not allowed to enter the temple, and had to stand in the courtyard covered deep with snow. His firm resolution and earnest desire, however, kept him standing continually on one spot for seven days and nights with beads of the frozen drops of tears on his breast. At last he cut off his left arm with a sharp knife, and presented it before the inflexible teacher to show his resolution to follow the master even at the risk of his life. Thereupon Bodhidharma admitted him into the order as a disciple fully qualified to be instructed in the highest doctrine of Mahayanism. Our master's method of instruction was entirely different from that of ordinary instructors of learning. He would not explain any problem to the learner, but simply help him to get enlightened by putting him an abrupt but telling question. Shang Kwang, for instance, said to Bodhidharma, perhaps with a sigh: "I have no peace of mind. Might I ask you, sir, to pacify my mind " "Bring out your mind (that troubles you so much)," replied the master, "here before me! I shall pacify it." "It is impossible for me," said the disciple, after a little consideration, "to seek out my mind (that troubles me so much)." "Then,"
exclaimed Bodhidharma, "I have pacified your mind." Hereon Shang Kwang was instantly Enlightened. This event is worthy of our notice, because such a mode of instruction was adopted by all Zen teachers after the first patriarch, and it became one of the characteristics of Zen. [1. For details, see Chwen Tang Luh and Den Ka Roku, by Kei Zan. As for the life of Bodhidharma, Dr. B. Matsumoto's 'A Life of Bodhidharma' may well be recommended to the reader. 2. A favourite disciple of Shakya Muni, and the Third Patriarch of Zen. 3. The: name means I Immovable,' and represents the firmness of thought. 4. Earth, water, fire, and air. to my marrow." So saying, Bodhidharma handed over the sacred Kachaya,[l] which he had brought from India to Hwui Ko, as a symbol of the transmission of the Law, and created him the Second Patriarch. [1. The clerical cloak, which is said to have been dark green. It became an object of great veneration after the Sixth Patriarch, who abolished the patriarchal system and did not hand the symbol over to successors. 2 The so-called Three Treasures of the Buddha, the Law, and the Order. on Sang Tsung the Kachaya handed down from Bodhidharma, and authorized him as the Third Patriarch. It is by Sang Tsung that the doctrine of Zen was first reduced to writing by his composition of Sin Sin Ming (Sin zin-mei, On Faith and Mind), a metrical exposition of the faith. [1. A good many commentaries were written on the book, and it is considered as one of the best books on Zen. 2. He died in A.D. 606, after his labour of thirteen years as the teacher. would never approach rulers and statesmen for the sake of worldly fame and profit, which they set at naught. 8. The Fifth and the Sixth Patriarchs.--Tao Sin transmitted the Law to Hung Jan (Ko-nin), who being educated from infancy, distinguished himself as the Abbot of the Hwang Mei Monastery at Ki Cheu. The Fifth Patriarch, according to his biographer, gathered about him seven hundred pupils, who came from all quarters. Of these seven hundred pupils the venerable Shang Sin (Jin-shu) was most noted for his learning and virtues, and be might have become the legitimate successor of Hung Jan, had not the Kachaya of Bodhidharma been carried away by a poor farmer's son of Sin Cheu. some difference between the Southern and the Northern people," objected the man, "but how could you distinguish one from the other as to the nature of Buddha?" The teacher recognized a genius in the man, but he did not admit the promising newcomer into the order, so Hwui Nang had to stay in the Monastery for eight months as a pounder of rice in order to qualify himself to be a Zen teacher. Perhaps nobody ever dreamed such an insignificant fellow as the rice-pounder could surpass the venerable scholar in a religious insight, but the Fifth Patriarch saw at once an Enlightened Soul expressed in those lines; therefore he made up his mind to give the Kachaya to the writer, in whom he found a great spiritual leader of future generations. But he did it secretly at midnight, lest some of the disciples from envy do violence to Hwui Nang. He was, moreover, cautious enough to advise his successor to leave the Monastery at once, and go back to the South, that the latter might conceal his Enlightenment until a time would come for his missionary activities. mere symbol of the patriarchal authority, and it is not a thing to be obtained by force. Take it along with you, if you long for it." Upon this Hwui Ming, who began to be ashamed of his base act, tried to lift the Kachaya, but in vain, for it was, as he felt, as heavy as the rock itself. At last he said to the Sixth Patriarch: "I have come here, my brother, not for the sake of this robe, but for the sake of the Law. Grant my hearty desire of getting Enlightened." "If you have come for the Law," replied Hwui Nang, "you must put an end to all your struggles and longings. Think neither of good nor of evil (make your mind pure from all idle thoughts), then see how is, Hwui Ming, your original (mental) physiognomy!" Being thus questioned, Ming found in an instant the Divine Light of Buddha within himself, and became a disciple of the Sixth Patriarch. 11. The Development of the Southern and of the Northern School of Zen.--After the death of the Fifth Patriarch the venerable Shang Siu, though not the legitimate successor of his master, was not inactive in the propagation of the faith, and gathered about him a number of enthusiastic admirers. This led to the foundation of the Northern school of Zen in opposition to the Southern school led by the Sixth Patriarch. The Empress Tseh Tien Wa Heu, the real ruler of China at that time, was an admirer of Shang Siu, and patronized his school, which nevertheless made no further development. two monks of the Monastery discussing about the flag floating in air. One of them said: "It is the wind that moves in reality, but not the flag." "No," objected the other, "it is the flag that moves in reality, but not the wind." Thus each of them insisted on his own one-sided view, and came to no proper conclusion. Then the Sixth Patriarch introduced himself and said to them: "It is neither the wind nor the flag, but your mind that moves in reality." Yin Tsung, having heard these words of the stranger, was greatly astonished, and thought the latter should have been an extraordinary personage. And when he found the man to be the Sixth Patriarch of Zen, he and all his disciples decided to follow Zen under the master. Consequently Hwui Nang, still clad like a layman, changed his clothes, and began his patriarchal career at that Monastery. This is the starting-point of the great development of Zen in China. is written in characters. How could such a dull fellow as I grasp its spirit?" "Then recite it once," responded the master; "I shall explain its spirit." Hereupon Fah Tah began to recite the sutra, and when he read it until the end of the second chapter the teacher stopped him, saying: "You may stop there. Now I know that this sutra was preached to show the so-called greatest object of Shakya Muni's appearing on earth. That greatest object was to have all sentient beings Enlightened just as He Himself." In this way the Sixth Patriarch grasped the essentials of the Mahayana sutras, and freely made use of them as the explanation of the practical questions about Zen. [1. The Teacher of Tien Tai (Ten-dai, A.D. 538-597), the founder of the Buddhist sect of the same name, was a great scholar of originality. His doctrine and criticism on the Tripitaka greatly influenced the whole of Buddhism after him. His doctrine is briefly given in the second chapter. and was at once acknowledged as a Zen teacher. When he reached the zenith of his fame, he was presented with a crystal bowl together with rich gifts by the Empress Tseh Tien; and it was in A.D. 705 that the Emperor Chung Tsung invited him in vain to proceed to the palace, since the latter followed the example of the Fourth Patriarch. [1. There exists Luh Tan Fah Pao Tan King (Roku-so-ho-bo-dan-kyo), a collection of his sermons. It is full of bold statements of Zen in its purest form, and is entirely free from ambiguous and enigmatical words that encumber later Zen books. In consequence it is widely read by non-Buddhist scholars in China and Japan. Both Hwui Chung (E-chu), a famous disciple of the Sixth Patriarch, and Do-gen, the founder of the Soto Sect in Japan, deny the authority of the book, and declare it to be misleading, because of errors and prejudices of the compilers. Still, we believe it to be a collection of genuine sections given by the Sixth Patriarch, though there are some mistakes in its historical narratives. [1. During the Tang dynasty (A.D. 618-906) China produced, besides the Sixth Patriarch and his prominent disciples, such great Zen teachers as Ma Tsu (Ba-so, died in 788), who is probably the originator of the Zen Activity; Shih Teu (Seki-to, died in 790), the reputed author of Tsan Tung Ki (San-do-kai), a metrical writing on Zen; Poh Chang (Hyaku-jo, died 814), who first laid down regulations for the Zen Monastery; Wei Shan (Yi-san), Yang Shan (Kyo-zan), the founders of the Wei Yang Sect; Hwang Pah (O-baku, died in 850), one of the founders of the Lin Tsi Sect, and the author of Chwen Sin Pao Yao, (Den-sin-ho-yo), one of the best works on Zen; Lin Tsi (Rin-zai, died in 866), the real founder of the Lin Tsi Sect; Tüng Shan (To-zan, died in 869), the real founder of the Tsao Tüng Sect; Tsao Shan (So-zan, died in 901), a famous disciple of Tüng Shan; Teh Shan (Toku-san, died in 865), who was used to strike every questioner with his staff; Chang Sha (Cho-sha, died in 823); Chao Cheu (Jo-shu, died in 897); Nan Tsüen (Nan-sen, died in 834); Wu Yeh (Mu-go, died in 823); who is said to have replied, 'Away with your idle thoughts,' to every questioner; Yun Yen (Un-gan, died in 829); Yoh Shan (Yaku-san, died in 834); Ta Mei (Tai-bai, died in 839), a noted recluse; Ta Tsz (Dai-ji, died in 862); Kwei Fung (Kei-ho, died in 841), the author of 'The Origin of Man,' and other numerous works; and Yun Kü (Un-go, died in 902). this age belong almost all the eminent men of letters, statesmen, warriors, and artists who were known as the practisers of Zen. To this age belongs the production of almost all Zen books, doctrinal and historical. [1. Among the great names of Zen believers the following are most important: Pang Yun (Ho-on, flourished in 785-804), whose whole family was proficient in Zen; Tsui Kiün (Sai-gun, flourished in 806-824); Luh Kang (Rik-ko), a lay disciple to Nan Tsün; Poh Loh Tien (Haku-raku-ten, died in 847), one of the greatest Chinese literary men; Pei Hiu (Hai-kyu, flourished 827-856), the Prime Minister under the Emperor Süen Tsung, a lay disciple to Hwang Pah; Li Ngao (Ri-ko, lived about 806), an author and scholar who practised Zen under Yoh Shan; Yü Chuh (U-teki, flourished 785-804), a local governor, a friend of Pang Yun; Yang Yih (Yo-oku, flourished in 976), one of the greatest writers of his age; Fan Chung Ngan (Han-chu an, flourished 1008-1052), an able statesman and scholar; Fu Pih (Fu shitsu, flourished 1041-1083), a minister under the Emperor Jan Tsung; Chang Shang Ying (Cho-sho-yei, 1086-1122), a Buddhist scholar and a statesman; Hwang Ting Kien (Ko-tei-ken, 1064-1094), a great poet; Su Shih (So-shoku, died in 1101), a great man of letters, well known as So-to-ba; Su Cheh (So-tetsu, died in 1112), a younger brother of So-to-ba, a scholar and minister under the Emperor Cheh Tsung; Chang Kiu Ching (Cho-Kyu-sei, flourished about 1131), a scholar and lay disciple of Ta Hwui; Yang Kieh (Yo-ketsu, flourished 1078-1086), a scholar and statesman. (1) Ching Tao Ko (Sho-do-ka), by Hüen Kioh (Gen-kaku). (3) Pao King San Mei (Ho-kyo-san-mai), by Tüng Shan (To-zan). (1) King teh Chwen Tan-Luh (Kei-toku-den-to-roku), published in 1004 by Tao Yuen (Do-gen). (2) Kwan Tang Luh (Ko-to roku), published in 1036 by Li Tsun Süh (Ri-jun-kyoku). (4) Lien Tang Luh (Ren-O-roku), published in 1183 by Hwui Wang (Mai-o). (5) Ching Tsung Ki (Sho-ju-ki), published in 1058 by Ki Sung (Kwai-su). of expression of Zen in action, which is entirely absent in any other faith. It was for the sake of this Zen Activity that Hwang Pah gave a slap three times to the Emperor Süen Tsung; that Lin Tsi so often burst out into a loud outcry of Hoh (Katsu); that Nan Tsüen killed a cat at a single stroke of his knife in the presence of his disciples; and that Teh Shan so frequently struck questioners with his staff. The Zen Activity was displayed by the Chinese teachers making use of diverse things such as the staff, the brush of long hair, the mirror, the rosary, the cup, the pitcher, the flag, the moon, the sickle, the plough, the bow and arrow, the ball, the bell, the drum, the cat, the dog, the duck, the earthworm--in short, any and everything that was fit for the occasion and convenient for the purpose. Thus Zen Activity was of pure Chinese origin, and it was developed after the Sixth Patriarch. For this reason the period previous to the Sixth Patriarch may be called the Age of the Zen Doctrine, while that posterior to the same master, the Age of the Zen Activity. [1. A long official staff (Shu-jo) like the crosier carried by the abbot of the monastery. 2. An ornamental brush (Hos-su) often carried by Zen teachers. rottenness within. As early as the Sung dynasty (960-1126) the worship of Buddha Amitabha stealthily found its way among Zen believers, who could not fully realize the Spirit of Shakya Muni, and to satisfy these people the amalgamation of the two faiths was attempted by some Zen masters. [1. The faith is based on Larger Sukhavati-vyuha, Smaller Sukhavati-vyuha, and Amitayus-dhyana-sutra. It was taught in India by Açvaghosa, Nagariuna, and Vasubandhu. In China Hwui Yuen (E-on, died in A.D. 416), Tan Lwan (Don-ran, died in 542), Tao Choh (Do-shaku), and Shen Tao (Zen-do) (both of whom lived about 600-650), chiefly taught the doctrine. It made an extraordinary progress in Japan, and differentiated itself into several sects, of which Jodo Shu and Shin Shu are the strongest. [1. The Emperor sent him to Japan in 1299 with some secret order, but he did nothing political, and stayed as a Zen teacher until his death. 2. A most renowned Zen master in the Yuen dynasty, whom the Emperor Jan Tsung invited to visit the palace, but in vain. 3. An author noted for his learning and virtues, who was rather a worshipper of Amitabha than a Zen monk. influence of the age. We are not, however, doing justice to the tendency of amalgamation in these times simply to blame it for its obnoxious results, because it is beyond doubt that it brought forth wholesome fruits to the Chinese literature and philosophy. Who can deny that this tendency brought the Speculative philosophy of the Sung dynasty to its consummation by the amalgamation of Confucianism with Buddhism especially with Zen, to enable it to exercise long-standing influence on society, and that this tendency also produced Wang Yang Ming, one of the greatest generals and scholars that the world has ever seen, whose philosophy of Consciences still holds a unique position in the history of human thought? Who can deny furthermore that Wang's philosophy is Zen in the Confucian terminology? [1. This well-known philosophy was first taught by Cheu Men Shuh (Shu-mo-shiku, died in 1073) in its definite form. He is said to have been enlightened by the instruction of Hwui Tang, a contemporary Zen master. He was succeeded by Chang Ming Tao (Tei-mei-do, died in 1085) and Chang I Chwen (Tei-i-sen, died in 1107), two brothers, who developed the philosophy in no small degree. And it was completed by Chu Tsz (Shu-shi, died in 1200), a celebrated commentator of the Confucian classics. It is worthy to note that these scholars practised Meditation just as Zen monks. See 'History of Chinese Philosophy' (pp. 215-269), by G. Nakauchi, and 'History of Development of Chinese Thought,' by R. Endo. 2 He was born in 1472, and died in 1529. His doctrine exercised a most fruitful influence on many of the great Japanese minds, and undoubtedly has done much to the progress of New Japan. [1. 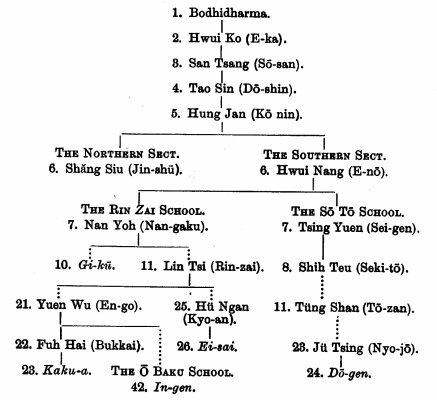 The Lin Tsi school was started by Nan Yoh, a prominent disciple of the Sixth Patriarch, and completed by Lin Tsi or Rin Zai. 2 Zen was first introduced into Japan by Do sha (629-700) as early as 653-656, at the time when the Fifth Patriarch just entered his patriarchal career. Do-sho went over to China in 653, and met with Hüen Tsang, the celebrated and great scholar, who taught him the doctrine of the Dharma-laksana. It was Hüen Tsang who advised Do-sho to study Zen under Hwui Man (E-man). After returning home, he built a Meditation Hall for the purpose of practising Zen in the Gan-go monastery, Nara. Thus Zen was first transplanted into Japan by Do-sho, but it took no root in the soil at that time. Next a Chinese Zen teacher, I Kung (Gi-ku), came over to Japan in about 810, and under his instruction the Empress Danrin, a most enthusiastic Buddhist, was enlightened. She erected a monastery named Dan-rin-ji, and appointed I Kung the abbot of it for the sake of propagating the faith. It being of no purpose, however, I Kung went back to China after some years. whole Tripitaka for eight years in the Hi-yei Monastery the then centre of Japanese Buddhism. After visiting holy places and great monasteries, he came home, bringing with him over thirty different books on the doctrine of the Ten-Dai Sect. This, instead of quenching, added fuel to his burning desire for adventurous travel abroad. So he crossed the sea over again in 1187, this time intending to make pilgrimage to India; and no one can tell what might have been the result if the Chinese authorities did not forbid him to cross the border. Thereon he turned his attention to the study of Zen, and after five years' discipline succeeded in getting sanction for his spiritual attainment by the Hü Ngan (Kio-an), a noted master of the Rin Zai school, the then abbot of the monastery of Tien Tung Shan (Ten-do-san). His active propaganda of Zen was commenced soon after his return in 1191 with splendid success at a newly built temple in the province of Chiku-zen. In 1202 Yori-iye, the Shogun, or the real governor of the State at that time, erected the monastery of Ken-nin-ji in the city of Kyo-to, and invited him to proceed to the metropolis. Accordingly he settled himself down in that temple, and taught Zen with his characteristic activity. (3) Abhidharma-pitaka, or a collection of philosophical and expository works. 2 The great monastery erected in 788 by Sai-cho (767-822), the founder of the Japanese Ten Dai Sect, known as Den Gyo Dai Shi. 3 The sect was named after its founder in China, Chi 1 (538-597), who lived in the monastery of Tien Tai Shan (Ten-dai-san), and was called the Great Teacher of Tien Tai. In 804 Den-gyo went over to China by the Imperial order, and received the transmission of the doctrine from Tao Sui (Do-sui), a patriarch of the sect. After his return he erected a monastery on Mount Hi-yei, which became the centre of Buddhistic learning. This provoked the envy and wrath of the Ten Dai and the Shin Gon teachers, who presented memorials to the Imperial court to protest against his propagandism of the new faith. 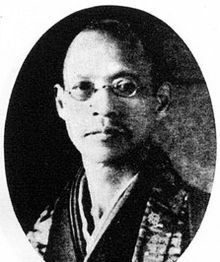 Taking advantage of the protests, Ei-sai wrote a book entitled Ko-zen-go-koku-ron ('The Protection of the State by the Propagation of Zen'), and not only explained his own position, but exposed the ignorance 2 of the protestants. Thus at last his merit was appreciated by the Emperor Tsuchi-mikado (1199-1210), and he was promoted to So Jo, the highest rank in the Buddhist priesthood, together with the gift of a purple robe in 1206. Some time after this he went to the city of Kama-kura, the political centre, being invited by Sane-tomo, the Shogun, and laid the foundation of the so-called Kama-kura Zen, still prospering at the present moment. [1. The Shin Gon or Mantra Sect is based on Mahavairocanabhi-sambodhi-sutra, Vajraçekhara-sutra, and other Mantra-sutras. It was established in China by Vajrabodhi and his disciple Amoahavajra, who came from India in 720. Ku kai (774-835), well known as Ko Bo Dai Shi, went to China in 804, and received the transmission of the doctrine from Hwui Kwo (Kei-ka), a, disciple of Amoghavajra. In 806 he came back and propagated the faith almost all over the country. For the detail see 'A Short History of the Twelve Japanese Buddhist Sects' (chap. viii. ), by Dr. Nanjo. 2 Sai-cho, the founder of the Japanese Ten Dai Sect, first learned the doctrine of the Northern School of Zen under Gyo-hyo (died in 797), and afterwards he pursued the study of the same faith under Siao Jan in China. Therefore to oppose the propagation of Zen is, for Ten Dai priests, as much as to oppose the founder of their own sect. purest form was done by Do-gen, now known as Jo Yo Dai Shi. Like Ei-sai, he was admitted into the Hi-yei Monastery at an early age, and devoted himself to the study of the Canon. As his scriptural knowledge increased, he was troubled by inexpressible doubts and fears, as is usual with great religious teachers. Consequently, one day he consulted his uncle, Ko-in, a distinguished Ten Dai scholar, about his troubles. The latter, being unable to satisfy him, recommended him Ei-sai, the founder of the new faith. But as Ei-sai died soon afterwards, he felt that he had no competent teacher left, and crossed the sea for China, at the age of twenty-four, in 1223. There he was admitted into the monastery of Tien Tung Shan (Ten-do-san), and assigned the lowest seat in the hall, simply because be was a foreigner. Against this affront he strongly protested. In the Buddhist community, he said, all were brothers, and there was no difference of nationality. The only way to rank the brethren was by seniority, and he therefore claimed to occupy his proper rank. Nobody, however, lent an ear to the poor new-comer's protest, so he appealed twice to the Chinese Emperor Ning Tsung (1195-1224), and by the Imperial order he gained his object. After four years' study and discipline, he was Enlightened and acknowledged as the successor by his master Jü Tsing (Nyo-jo died in 1228), who belonged to the Tsao Tung (So To) school. He came home in 1227, bringing with him three important Zen books. Some three years he did what Bodhidharma, the Wall-gazing Brahmin, had done seven hundred years before him, retiring to a hermitage. at Fuka-kusa, not very far from Kyo-to. Just like Bodhidharma, denouncing all worldly fame and gain, his attitude toward the world was diametrically opposed to that of Ei-sai. As we have seen above, Ei-sai never shunned, but rather sought the society of the powerful and the rich, and made for his goal by every means. But to the Sage of Fuka-kusa, as Do-gen was called at that time, pomp and power was the most disgusting thing in the world. Judging from his poems, be seems to have spent these years chiefly in meditation; dwelling now on the transitoriness of life, now on the eternal peace of Nirvana; now on the vanities and miseries of the world; now listening to the voices of Nature amongst the hills; now gazing into the brooklet that was, as he thought, carrying away his image reflected on it into the world. [1. It was in this monastery (built in 1236) that Zen was first taught as an independent sect, and that the Meditation Hall was first opened in Japan. Do-gen lived in the monastery for eleven years, and wrote some of the important books. Za-zen-gi ('The Method of Practising the Cross-legged Meditation') was written soon after his return from China, and Ben-do-wa and other essays followed, which are included in his great work, entitled Sho-bo-gen-zo) ('The Eye and Treasury of the Right Law'). province of Echi-zen, where his ideal monastery was built, now known as Ei-hei-ji. In 1247, being requested by Toki-yori, the Regent General (1247-1263), he came down to Kama-kura, where he stayed half a year and went back to Ei-hei-ji. After some time Toki-yori, to show his gratitude for the master, drew up a certificate granting a large tract of land as the property of Ei-hei-ji, and handed it over to Gen-myo, a disciple of Do-gen. The carrier of the certificate was so pleased with the donation that he displayed it to all his brethren and produced it before the master, who severely reproached him saying: "O, shame on thee, wretch! Thou art -defiled by the desire of worldly riches even to thy inmost soul, just as noodle is stained with oil. Thou canst not be purified from it to all eternity. I am afraid thou wilt bring shame on the Right Law." On the spot Gen-myo was deprived of his holy robe and excommunicated. Furthermore, the master ordered the 'polluted' seat in the Meditation Hall, where Gen-myo was wont to sit, to be removed, and the 'polluted' earth under the seat to be dug out to the depth of seven feet. Yet thrice it came, Imperial favour deep. At aged Monk in purple as insane." He was never seen putting on the purple robe, being always clad in black, that was better suited to his secluded life. 4. The Social State of Japan when Zen was established by Ei-sai and Do-gen.--Now we have to observe the condition of the country when Zen was introduced into Japan by Ei-sai and Do-gen. Nobilities that had so long governed the island were nobilities no more. Enervated by their luxuries, effeminated by their ease, made insipient by their debauchery, they were entirely powerless. All that they possessed in reality was the nominal rank and hereditary birth. On the contrary, despised as the ignorant, sneered at as the upstart, put in contempt as the vulgar, the Samurai or military class had everything in their hands. It was the time when Yori-tomo (1148-1199) conquered all over the empire, and established the Samurai Government at Kama-kura. It was the time when even the emperors were dethroned or exiled at will by the Samurai. It was the time when even the Buddhist monks frequently took up arms to force their will. It was the time when Japan's independence was endangered by Kublai, the terror of the world. It was the time when the whole nation was full of martial spirit. It is beyond doubt that to these rising Samurais, rude and simple, the philosophical doctrines of Buddhism, represented by Ten Dai and Shin Gon, were too complicated and too alien to their nature. But in Zen they could find something congenial to their nature, something that touched their chord of sympathy, because Zen was the doctrine of chivalry in a certain sense. [1. The Samurai Government was first established by Yoritomo, of the Minamoto family, in 1186, and Japan was under the control of the military class until 1867, when the political power was finally restored to the Imperial house. 5. The Resemblance of the Zen Monk to the Samurai.--Let us point out in brief the similarities between Zen and Japanese chivalry. First, both the Samurai and the Zen monk have to undergo a strict discipline and endure privation without complaint. Even such a prominent teacher as Ei-sai, for example, lived contentedly in such needy circumstances that on one occasion he and his disciples had nothing to eat for several days. Fortunately, they were requested by a believer to recite the Scriptures, and presented with two rolls of silk. The hungry young monks, whose mouths watered already at the expectation of a long-looked-for dinner, were disappointed when that silk was given to a poor man, who called on Ei-sai to obtain some help. Fast continued for a whole week, when another poor follow came in and asked Ei-sai to give something. At this time, having nothing to show his substantial mark of sympathy towards the poor, Ei-sai tore off the gilt glory of the image of Buddha Bheçajya and gave it. The young monks, bitten both by hunger and by anger at this outrageous act to the object of worship, questioned Ei-sai by way of reproach: "Is it, sir, right for us Buddhists to demolish the image of a Buddha?" "Well," replied Ei-sai promptly, "Buddha would give even his own life for the sake of suffering people. How could he be reluctant to give his halo?" This anecdote clearly shows us self-sacrifice is of first importance in the Zen discipline. Samurais who were really starved to death in spite of their having a hundred pieces of gold carefully preserved to meet the expenses at the time of an emergency; hence the proverb: "The falcon would not feed on the ear of corn, even if he should starve." Similarly, we know of no case of Zen monks, ancient and modern, who got rich by any ignoble means. They would rather face poverty with gladness of heart. Fu-gai, one of the most distinguished Zen masters just before the Restoration, supported many student monks in his monastery. They were often too numerous to be supported by his scant means. This troubled his disciple much whose duty it was to look after the food-supply, as there was no other means to meet the increased demand than to supply with worse stuff. Accordingly, one day the disciple advised Fu-gai not to admit new students any more into the monastery. Then the master, making no reply, lolled out his tongue and said: "Now look into my mouth, and tell if there be any tongue in it." The perplexed disciple answered affirmatively. "Then don't bother yourself about it. If there be any tongue, I can taste any sort of food." Honest poverty may, without exaggeration, be called one of the characteristics of the Samurais and of the Zen monks; hence a proverb: " The Zen monk has no money, moneyed Monto knows nothing." [1. The priest belonging to Shin Shu, who are generally rich. "Rin-zai, according to this advice, approached Obak and repeated the question, but before he finished the master gave him a slap. "When Rin-zai came back, the elder asked how the interview went. Said Rin-zai: 'Before I could finish my question the master slapped me, but I fail to grasp its meaning.' The elder said: 'You go to him again and ask the same question.' When he did so, he received the same response from the master. But Rin-zai was urged again to try it for the third time, but the outcome did not improve. "When Rin-zai came to see the master, the latter advised him not to go anywhere else. but to Dai-gu (Tai-yu) of Kaoan, for he would be able to instruct him in the faith. And he related, being asked for further information, all that had happened there. "Obak said: 'As soon as that fellow shows himself up here, I shall have to give him a good thrashing.' 'You need not wait for him to come; have it right this moment,' was the reply; and with this Rin-zai gave his master a slap on the back. "Obak said: 'How dares this lunatic come into my presence and play with a tiger's whiskers?' Rin-zai then burst out into a Ho, and Obak said: 'Attendant, come and carry this lunatic away to his cell.'" [1. A loud outcry, frequently made use of by Zen teachers, after Rin-zai. Its Chinese pronunciation is 'Hoh,' and pronounced 'Katsu' in Japanese, but 'tsu' is not audible. The barbarians, moved by this calm resolution and dignified air of Tsu Yuen, rightly supposed him to be no ordinary personage, and left the monastery, doing no harm to him. 9. Zen and the Regent Generals of the Ho-Jo Period.--No wonder, then, that the representatives of the Samurai class, the Regent Generals, especially such able rulers as Toki-yori, Toki-mune, and others noted for their good administration, of the Ho-jo period (1205-1332) greatly favoured Zen. They not only patronized the faith, building great temples and inviting best Chinese Zen teachers. [1. The man was not a pure Zen master, being a disciple of Kumarajiva, the founder of the San Ron Sect. This is a most remarkable evidence that Zen, especially the Rin Zan school, was influenced by Kumarajiva and his disciples. For the details of the anecdote, see E-gen.
2. To-fuku-ji, the head temple of a sub-sect of the Rin Zai under the same name, was built in 1243. Ken-cho-ji, the head temple of a subsect of the Rin Zai under the same name, was built in 1253. En-gaku ji, the head temple of a sub-sect of the Rin Zai under the same name, was built in 1282. Nan-zen-ji, the head temple of a sub-sect of the Rin Zai under the same name, was erected in 1326. Greener than moss tiny grass grows. But the gate by itself opens to the Wind's knock." Path of Great is then nigh." His successor, Toki-mune (1264-1283), a bold statesman and soldier, was no less of a devoted believer in Zen. Twice he beheaded the envoys sent by the great Chinese conqueror, Kublai, who demanded Japan should either surrender or be trodden under his foot. And when the alarming news of the Chinese Armada's approaching the land reached him, be is said to have called on his tutor, Tsu Yuen, to receive the last instruction. "Now, reverend sir," said. he, "an imminent peril threatens the land." "How art thou going to encounter it?" asked the master. Then Toki-mune burst into a thundering Ka with all his might to show his undaunted spirit in encountering the approaching enemy. "O, the lion's roar!" said Tsu Yuen. "Thou art a genuine lion. Go, and never turn back." Thus encouraged by the teacher, the Regent General sent out the defending army, and successfully rescued the state from the mouth of destruction, gaining a splendid victory over the invaders, almost all of whom perished in the western seas. [1. Although Zen was first favoured by the Ho-jo Regency and chiefly prospered at Kama-kura, yet it rapidly began to exercise its influence on nobles and Emperors at Kyo-to. This is mainly due to the activity of En-ni, known as Sho-Ichi-Koku-Shi (1202-1280), who first earned Zen under Gyo-yu, a disciple of Ei-sai, and afterwards went to China, where he was Enlightened under the instruction of Wu Chun, of the monastery of King Shan. After his return, Michi-iye (Fuji-wara), a powerful nobleman, erected for him To-fuku-ji in 1243, and he became the founder of a sub-sect of the Rin Zai, named after that monastery. The Emperor Go-saga (1243-1246), an admirer of his, received the Moral Precepts from him, One of his disciples, To-zan, became the spiritual adviser of the Emperor Fushi-mi (1288-1298), and another disciple, Mu kwan, was created the abbot of the monastery of Nan-zen-ji by the Emperor Kame-yama (1260-1274), as the founder of a sub-sect of the Rin Zai under the same name. Thus becoming, as it were, an indispensable discipline for the Samurai, Zen never came to an end with the Ho-jo period, but grew more prosperous than before during the reign of the Emperor Go-dai-go, one of the most enthusiastic patrons of the faith. [1. The event is detailed at length in a life of So-shun, but some historians suspect it to be fictitious. This awaits a further research. The Shoguns of the Ashi-kaga period (1338-1573) were not less devoted to the faith than the Emperors who succeeded the Emperor Go-dai-go. And even Taka-uji (1338-1357), the notorious founder of the Shogunate, built a monastery and invited So-seki, better known as Mu-So-Koku-Shi, who was respected as the tutor by the three successive Emperors after Go-dai-go. Taka-uji's example was followed by all succeeding Shoguns, and Shogun's example was followed by the feudal lords and their vassals. This resulted in the propagation of Zen throughout the country. We can easily imagine how Zen was prosperous in these days from the splendid monasteries built at this period, such as the Golden Hall Temple and the Silver Hall Temple that still adorn the fair city of Kyo-to. [1. So-seki (1276-1351) was perhaps the greatest Zen master of the period. Of numerous monasteries built for him, E-rin-ji, in the province of Kae, and Ten-ryu-ji, the head temple of a sub-sect of the Rin Zai under the same name, are of importance, Out of over seventy eminent disciples of his, Gi-do (1365-1388), the author of Ku-ge-shu; Shun-oku (1331-1338), the founder of the monastery of So-koku-ji, the head temple of a sub-sect of the Rin Zai under the same name; and Zek-kai (1337-1405), author of Sho-ken-shu, are best known. [1. Shin-gen practised Zen under the instruction of Kwai-sen, who was burned to death by Nobu-naga (O-da) in 1582. See Hon-cho-ko-so-den. shows us how Zen was practically lived by the Samurais of the Dark Age. Although the priests of other Buddhist sects had their share in these bloody affairs, as was natural at such a time, yet Zen monks stood aloof and simply cultivated their literature. Consequently, when all the people grew entirely ignorant at the end of the Dark Age, the Zen monks were the only men of letters. None can deny this merit of their having preserved learning and prepared for its revival in the following period. [1. After the introduction of Zen into Japan many important books were written, and the following are chief doctrinal works: Ko-zen-go-koku-ron, by Ei-sai; Sho bo-gen-zo; Gaku-do-yo-zin-shu; Fu-kwan-za-zen-gi; Ei-hei-ko-roku, by Do-gen; Za-zen-yo-zin-ki; and Den-ko-roku, by Kei-zan. still favoured by feudal lords and their vassals, and almost all provincial lords embraced the faith. It was about the middle of this period that the forty-seven vassals of Ako displayed the spirit of the Samurai by their perseverance, self-sacrifice, and loyalty, taking vengeance on the enemy of their deceased lord. The leader of these men, the tragic tales of whom can never be told or heard without tears, was Yoshi-o (O-ishi died 1702), a believer of Zen, and his tomb in the cemetery of the temple of Sen-gaku-ji, Tokyo, is daily visited by hundreds of his admirers. [1. See "Zen Shu," No. 151. Conquering-enemy-without-fighting-school.' 'Don't tell a fib, old monk. If you could conquer the enemy without fighting, what then is your sword for?' 'My sword is not to kill, but to save,' said Boku-den, making use of Zen phrases; 'my art is transmitted from mind to mind.' 'Now then, come, monk,' challenged the man, 'let us see, right at this moment, who is the victor, you or I.' The gauntlet was picked up without hesitation. 'But we must not fight,' said Boku-den, 'in the ferry, lest the passengers should be hurt. Yonder a small island you see. There we shall decide the contest.' To this proposal the man agreed, and the boat was pulled to that island. No sooner had the boat reached the shore than the man jumped over to the land, and cried: 'Come on, monk, quick, quick!' Boku-den, however, slowly rising, said: 'Do not hasten to lose your head. It is a rule of my school to prepare slowly for fighting, keeping the soul in the abdomen.' So saying he snatched the oar from the boatman and rowed the boat back to some distance, leaving the man alone, who, stamping the ground madly, cried out: 'O, you fly, monk, you coward. Come, old monk!' 'Now listen,' said Boku-den, 'this is the secret art of the Conquering-enemy-without-fighting-school. Beware that you do not forget it, nor tell it to anybody else.' Thus, getting rid of the brawling fellow, Boku-den and his fellow-passengers safely landed on the opposite shore." noted for its Chinese style of architecture, now known as O-baku-san. The teachers of the same school came one after another from China, and Zen peculiar to them, flourished a short while. [1. Tsih Fei (Soku-hi died 1671), Muh Ngan (Moku-an died 1684), Kao Tsüen (Ko-sen died 1695), the author of Fu-so-zen-rin-so-bo-den, To-koku-ko-so-den, and Sen-un-shu, are best known. TABLE OF THE TRANSMISSION OF ZEN FROM CHINA. TO JAPAN. It was also in this period that Zen gained a great influence on the popular literature characterized by the shortest form of poetical composition. This was done through the genius of Ba-sho, a great literary man, recluse and traveller, who, as his writings show us, made no small progress in the study of Zen. Again, it was made use of by the teachers of popular  ethics, who did a great deal in the education of the lower classes. In this way Zen and its peculiar taste gradually found its way into the arts of peace, such as literature, fine art, tea-ceremony, cookery, gardening, architecture, and at last it has permeated through every fibre of Japanese life. [1. He (died 1694) learned Zen under a contemporary Zen master (Buccho), and is said to have been enlightened before his reformation of the popular literature. Arthur, who, after the sacrifice of his two sons for the country in the Russo-Japanese War, gave up his own and his wife's life for the sake of the deceased Emperor. He died not in vain, as some might think, because his simplicity, uprightness, loyalty, bravery, self-control, and self-sacrifice, all combined in his last act, surely inspire the rising generation with the spirit of the Samurai to give birth to hundreds of Nogis. Now let us see in the following chapters what Zen so closely connected with Bushido teaches us.